Nashville’s Fats Kaplin is a native of New York City where he grew up—as he says in his bio—“falling asleep to the sound of Johnny Pineapple’s Hawaiian Revue seeping through the steam pipes from the apartment below and Cantor Ackerman practicing next door.” His family and family friends were artists, illustrators, and cartoonists. But from an early age, Fats was drawn to jazz and string band 78s cut in the late ‘20s and ‘30s, an era that many serious musicians consider the most vibrant, dynamic, and difficult period in modern American popular music. Like many gifted musicians, Fats took to a number of instruments at a young age and became proficient in all of them including two of the most difficult, steel guitar and fiddle. His long list of credits include his own group, Kane Welch Kaplin, as well as Beck, Elvis Costello, Manhattan Transfer, and the WPA Ballclub. But what keeps musicians on both coasts coming back to Fats is his unparalleled combination of technique and soul along with his spirited thirst for artistic and personal expression that is—in the words of Duke Ellington--beyond category. He is a consummate professional with a wicked sense of humor and he chooses his battles—so to speak—carefully. No note he plays is wasted or superfluous. And when it comes to heroes, Fats can talk at length about Charlie Patton, Joe Venutti, or 78s cut by Turkish and Armenian fiddlers in the late ‘20s. It’s no surprise that Fats has contributed to a number of excellent Third Man Records releases over the last year as well as Jack White’s current tour to support the new album, Lazaretto. Fats’ solo albums are chock full of future fiddle and banjo standards (as well ingenious re-imaginings of past standards) and with wife Kristi Rose, Fats is just as likely to be seen playing a classic archtop as he is an oud. 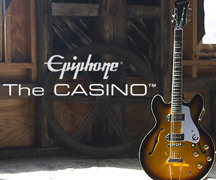 Epiphone recently caught up with Fats, who is enjoying his new Epiphone Emperor Regent archtop. We caught up with Fats during a break in White's ongoing world tour. You grew up in New York City. What do you remember about the music scene around you and what instrument first got your attention? Growing up in NYC in the 1960's, for me it was the folk scene. Pete Seeger and the banjo and the New Lost City Ramblers, who I saw on his show, Rainbow Quest. Who were some of the players you admired? Well, some of the artists on the scene at that time were Jim Kweskin, Dave Van Ronk, John Fahey, the Incredible Stringband. And again the NLCRs. Through their music, I became aware of all the 78 reissues that were available at the Lincoln Center Library. And then I became deeply immersed in rural string bands, blues and early jazz. What was it that got your attention and are those elements in your playing today? There was a rawness and a fire about a lot of this music and a realness. To this day, it still reaches out and grabs me. As a teenager, I didn’t like anything that smacked of being commercial. I didn’t listen to Top 40 Radio. I just wanted to hear Gid Tanner and The Skillet Lickers. Musically, whatever I do, no matter how far I’ve branched out, those roots are still there. Were you a serious musician right away—did you think you would do this for a living? I pretty much was a serious musician right away. 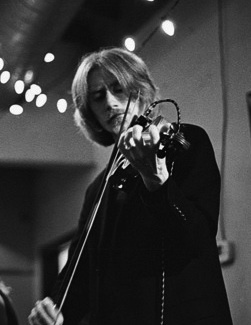 The idea of being an itinerant fiddle player greatly appealed to me as a teenager and I went on the road at 17. My first recording and extended touring was with the country blues guitarist Roy Bookbinder. I did two albums with him for Nick Pearl’s Blue Goose label in New York City. When you did decide to concentrate on music, was that decision influenced by your family? Were they musicians or artists? I had an uncle who played some banjo and he influenced me to pick it up. I quickly moved to fiddle and other stringed instruments. My immediate family were all artists and, I think, were a bit baffled with my fascination with rural southern culture. 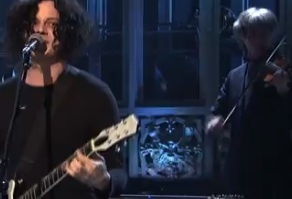 It seems like doing sessions for Third Man Records has been a very good fit. Working with Jack has been very eye opening. He has this ability to not second guess himself. He is fearless. He really goes with his instinct, which makes the whole process very exciting. And, of course, his great belief in analog recording is very appealing to me. You’re a big fan of string band music, which tends to go by “feel” rather than charts. Does that translate well to rock and what you’re doing now? Yeah. I do think that. You’ve also worked with many artists as a steel guitarist. There’s resurgence in that now. Who do you go back to for ideas and inspiration for Hawaiian and Pedal steel guitar? I still draw inspiration from the players of the ‘50s and 60's, particularly the West Coast players like Ralph Mooney and Tom Brumley. In that early period of the development of the pedal steel, these musicians were making it up as they went along. There was no template. It was exciting. They were doing it by the seat of their pants and you can hear it. And from a little earlier period, I still think Jerry Byrd and Sol Hoopii, in terms of tone and technique, are unsurpassed. Nowadays, I think sacred steel really rocks. For your own records, do you have a favorite composing instrument? It depends somewhat on what I'm working on. If I'm writing songs with lyrics, as I do with my wife Kristi Rose, I would tend to use the guitar. 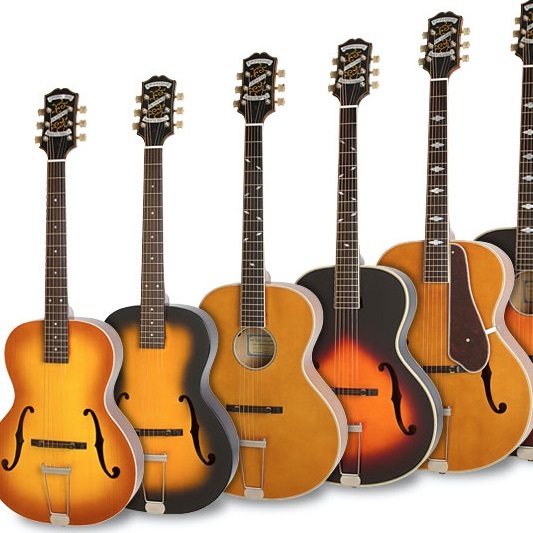 But for instrumentals, it could be anything; violin, mandolin, even the oud. Inspiration comes from whatever instrument I have in my hands. Do you write all the time? Are there artists or vocalists that put you in a composing mood? I guess I sort of go in spurts on writing. I really draw things together when I'm up at the house on Maloney Road in Southern Illinois. This is the farm where my wife was born and raised. And where we go to write, record and be with family.